Afterwards please repeat the installation process of Vitascene V3 or Heroglyph V4 and the corresponding plug-in will then be available within EDIUS. Please see the enclosed manual for further details where to find the plug-ins within EDIUS. 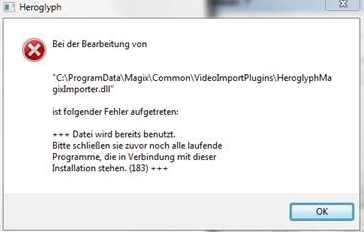 Wie löse ich das Installationsproblem mit Heroglyph V4 in MAGIX Video deluxe 2014? Es wird während der Installation von Heroglyph V4 (aus dem MAGIX Video deluxe 2014 bundle) folgendes gemeldet. Dieses Problem tritt nicht auf, wenn Sie Heroglyph V4 zum ersten Mal installieren. Wenn jedoch Heroglyph V4 bereits installiert ist und von MAGIX Video Deluxe geladen ist, dann folgt diese Fehlermeldung. You have created a project in the earlier Heroglyph version V2.5 and would like to continue editing the project (using the enhanced Design options) in Heroglyph V4. 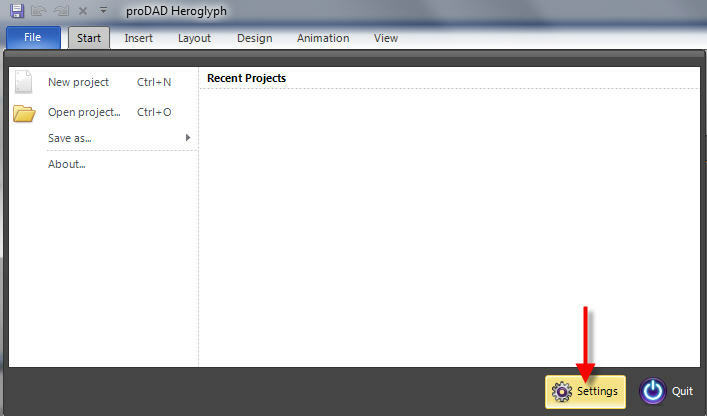 In order to do so, just open the "File/Open Project" option in Heroglyph V4. Navigate to the location where you have saved your project and import it. Now you can use the new Design options in your project and save the changes afterwards. If you create your own Object presets as TIF-Files in the transparent Background (with Alpha key), you can use them also as an object in the Route project. The installed Object Presets from the CreativePack 2 can be used, too. They are available, for instance, in the directory: "C:\Programs\proDAD\Heroglyph-2.5\clipart\cp2\image". Open the directory and adopt an object of your choice in the previously created route (directly in the preview) in Heroglyph V4 via Drag & Drop. Before doing so, select the Timeline object in the Timeline to make sure that the right object will be replaced. Apart from Heroglyph 4 you have also installed Heroglyph 2.6 and some (if not all) Creative Packs 1-5 and you would like to use these versions? Of course you can use the Templates/Project presets from these components in Heroglyph 4 – you can even upgrade them with enhanced Design options…. Import, for instance,Project presets from the "C:\Program Files (x86)\proDAD\Heroglyph-2.5\tl\model" directory in Heroglyph V4 via the “File/Open project" option. You will find various Project presets in the subfolders cp2, cp3, cp4 und cp5. 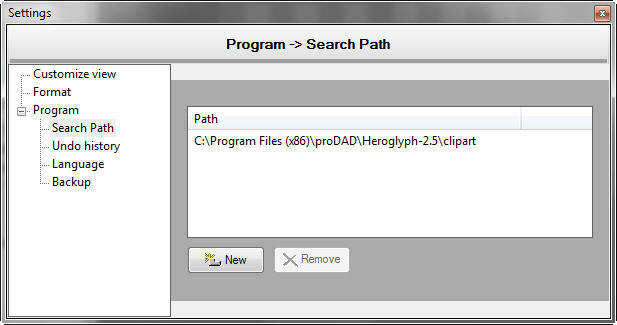 Here you add the path to Cliparts in the Settings/Program/Search Path in Heroglyph V4. This safeguards the correct importation of all the Project Components (e.g. Background images).